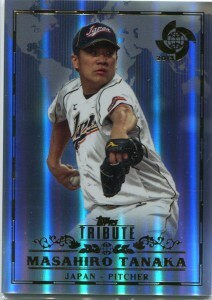 After much discussion and debate, Masahiro Tanaka seems to be headed to the American Major Leagues for the 2014 season. Where he will be putting his skills to use, however, is still open for discussion. Just about every team in the league could use the talent that Tanaka possesses, but only a few will be willing to enter the high-stakes bidding that is sure to develop. Any team that wishes to negotiate with Tanaka will have to commit $20 million in a posting fee to Tanaka’s team in Japan, although only the team that ends up signing the star pitcher will actually have to pay the $20 million. As with any player that makes their way over from Japan, there are plenty of question marks as to how their performance will translate to the American game. With that said, there is no lack of success stories of players to make the transition from NPB to MLB with great results. Some of the most notable examples include Ichiro Suzuki, Hideki Matsui, and Yu Darvish. On the other side of the coin, Daisuke Matsuzaka and Kei Igawa were both acclaimed starting pitchers who failed to find their footing with the Red Sox and Yankees, respectively. In the case of Tanaka, most analysts agree that he is on track to be a successful starting pitcher in the major leagues. He has experienced incredible success in Japan, including a 24-0 record last season. Tanaka is just 25 years old, has a powerful fastball, and a 6’2” frame. On paper, he would seem to compare reasonably with Yu Darvish, who has been successful with the Texas Rangers for the past two seasons. Which Teams are in the Race? Most teams don’t divulge their free agent interests ahead of time, so there is only speculation as to which teams will be significant players for Tanaka’s services. Six teams that are believed to have strong interest, and the funds to make a deal, are the Rangers, Yankees, Mariners, Diamondbacks, Cubs, and Angels. How much each of those teams is interested, or if there any other other ‘sleeper’ teams waiting in the wings, is yet to be seen. On the surface, the Angels and Rangers seem like long shots simply because of their previous financial commitments. During this off-season, the Rangers have taken on Prince Fielder and Shin-Soo Choo, both with significant contracts. The Angels spent big in the last two off-seasons, with Pujols and Hamilton. While the Mariners just spent a fortune on Robinson Cano, rumor has it that there is more room in the Seattle budget. The Yankees, for their part, can never be counted out of the bidding for any free agent – especially given their lack of depth presently in their starting rotation. No one can be sure as to what Masahiro Tanaka will bring to MLB when he arrives for the 2014 season. With his impressive resume from his career in Japan, it seems likely that he will have success on American soil as well. If he lives up to the potential that he brings with him, the team that wins this sweepstakes will have gotten a great asset for their pitching staff. 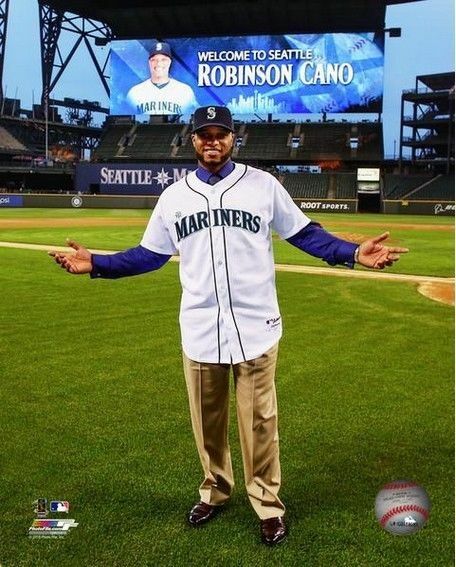 Robinson Cano has Landed – in Seattle? Well – nobody saw that coming. 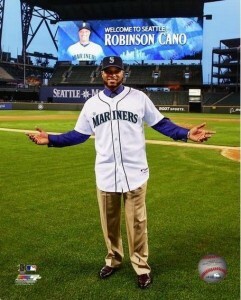 While the Mariners were rumored to be interested in the services of star second baseman Robinson Cano (and why not? ), the consensus thinking was that any negotiation with the Mariners was simply an effort to drive up his price with the Yankees. Wrong. Cano received a huge offer from the Mariners, and decided to pack up and head out west. He will team up with Felix Hernandez, Hisashi Iwakuma, and others to try and bring back a contending team to the Pacific Northwest. In Robinson Cano, the Mariners are getting one of the most accomplished and productive players in all of baseball over the last several years. Cano hits for average, hits for power, plays great defense at second, and more. Of course, at $240 million over 10 years, the Mariners are banking on the fact that Cano will continue to be the productive player that he has been for many years to come. Given the struggle that Seattle has faced in scoring runs over the last few seasons, any offensive addition will be a welcome one for both fans and pitchers in the Emerald City. One of the major questions in the days after Cano signed with the Mariners was whether or not this move alone is enough to make the Mariners a contending team in a division with the Rangers, A’s, and Angels. The answer, at this point, is probably not. However, the Mariners are likely not finished making moves during this off-season, and their opening day roster could very well look different than it does today. On the pitching side of the game, the Mariners seem to be positioned pretty strongly, with stars Hernandez and Iwakuma backed up by young talent like Taijuan Walker and James Paxton. While the offense remains a concern, young hitters such as Dustin Ackley and Justin Smoak might have an easier time fulfilling potential with an established star like Cano hitting in the middle of the lineup and taking some of the pressure off of their shoulders. What to Expect from Cano? The safe bet is to expect Cano to keep on doing what Cano has always done – hit and field. He isn’t a player that will impress you with his all-out hustle and effort – he is more akin to another player that is legendary in Seattle, Ken Griffey Jr. Junior was know for the ease with which he played, and Cano is similar in that way. He is very much a natural on the baseball field, and has a knack for making the game look easier than it is. It remains to be seen if Robinson Cano is able to take the Mariners to the next level and make them a team that the Rangers and A’s have to worry about in the standings. What is already clear, however, is that fans in Seattle have their first star hitter in many years, and there will be more anticipation for the 2014 Mariners’ season than any in recent memory.